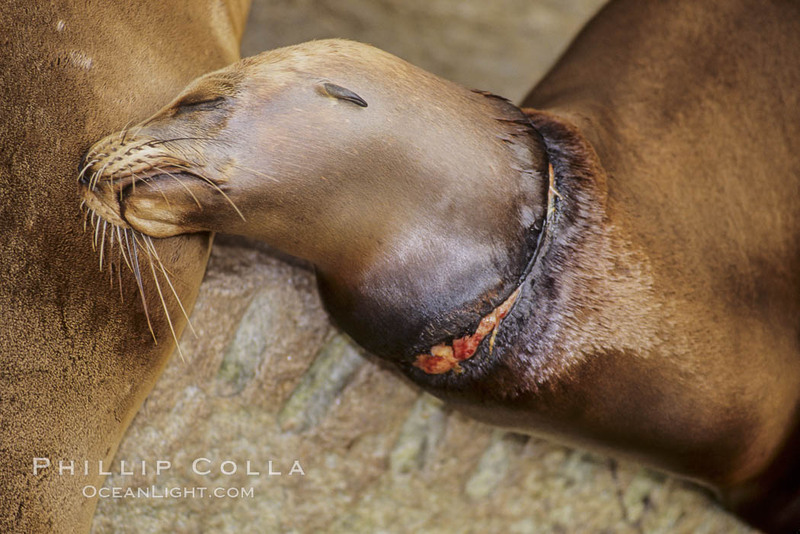 This California sea lion (Zalophus californianus) has a severe neck laceration caused by what is likely monofiliment fishing line wrapped around its neck and digging into its skin. Monofiliment fishing line is an exceptionally thin and strong type of synthetic line used for sportfishing. Given that it is designed to be nearly invisible in the water (so the fish do not see it), it is easy to imagine how a passing sea lion, turtle or diving seabird might become tangled in it were the animal unfortunate enough to encounter abandoned monofiliment line in the water. Abandoned fishing line? Absolutely! Fisherman often simply cut their lines if they are unable to clear a snagged line. The abandoned line will last hundreds of years in the water, waiting there to entangle whatever that it comes in contact with. Such line is quite thin and consequently cuts easily into even the tough hides of sea lions. And it is strong, meant to withstand the pull of strong gamefish, so it will not easily give way even if the sea lion were to somehow gain purchase on it and try to break it. Instead, the monofiliment line will slowly, steadily cut into the sea lion’s flesh, eventually causing the animal to suffer from suffocation, starvation or infection. Appearances nothwithstanding, this sea lion was simply dozing and had been awake and alert minutes before this photo. However, the injury it is experiencing clearly has the potential for infection. I did not see this sea lion again so do not know if it was rescued and rehabilitated or ? See more photos of California sea lions (Zalophus californianus).